Horsepower & Heels Racing is proud to support the Breast Cancer Research Foundation as our official charity partnership. Breast Cancer has hit close to home for Erica Ortiz, driver of Horsepower & Heels Racing’s Twin Turbo Pro Mod Mustang, impacting her grandmother, several aunts, and other women she holds dearly. That’s why Horsepower & Heels has joined forces with the Breast Cancer Research Foundation, an organization doing everything possible to help educate, prevent, and fund research to find a cure. Please help us support the Breast Cancer Research Foundation by making a tax-deductible donation. The process is fast, easy and secure. 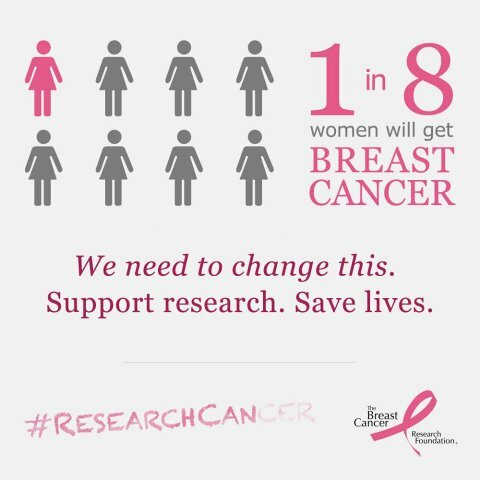 You’ll be helping some of the world’s best researchers discover how to prevent and cure breast cancer. And because 91 cents of each dollar spent by BCRF goes directly to research and awareness programs, you can be sure your money is making a difference. Remember, every dollar counts. But if you can’t make a donation right now, help me reach my goal by sharing this page on Facebook and Twitter. Or, even better, send an e-mail to friends you think might be interested in contributing and include a link to our page! Thank you so much for your generosity. You are truly helping us bring an end to cancer.